The BMC Lung Cancer Screening Program was created to identify and assess patients at risk for lung cancer, with the goal of early diagnosis and treatment. Patients who are interested in lung cancer screening should talk with their primary care provider, or contact the BMC Lung Nodule Clinic at (617) 638-7480. Boston Medical Center has received American College of Radiology accreditation as a Lung Cancer Screening Center. In 2011, the National Lung Screening Trial (NLST) found a 20% reduction in relative risk of lung cancer death in patients who were screened using low dose chest CT scans. The results of the trial were published in the New England Journal of Medicine. Review the Medicare decision memo for more detailed information about eligibility criteria. Discussing risks and benefits of screening. This PDF, produced by Boston medical Center, provides some talking points. The following review article is a good reference: "Benefits and Harms of CT Screening for Lung Cancer: A Systematic Review" JAMA. 2012; 307(22): 2418-2429. This decision aid includes a personalized risk calculator. For counseling on the importance of smoking cessation and maintenance of abstinence from smoking, learn about the Tobacco Treatment Center. Order for a low dose non-contrast CT (CT lung screening). BMC Physicians: To make an order for a low dose CT scan in EPIC, enter "CT Lung Screening". This is a sample of appropriate documentation to include in your office note to reflect that the clinic visit met the above criteria. Fax this completed form and an order for a "low dose non-contrast CT scan" to 617.414.7891, and call 617.414.9729, option #2 to schedule the exam. Lung cancer screening CT reports at BMC use the American College of Radiology Lung-RADS reporting system. 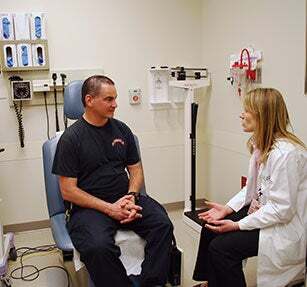 The Lung Nodule Clinic was developed through an interdisciplinary collaboration between pulmonologists, radiologists, and thoracic surgeons, and is staffed by board-certified pulmonologists with expertise and interest in lung cancer. The clinic uses a shared decision-making model in which the risks and benefits of evaluation/treatment options are discussed. Recommendations are communicated to both patients and referring physicians. Patients requiring thoracic surgery consultation can be seen on the same day in the Multi-Disciplinary Thoracic Oncology Clinic. Tobacco dependent patients are offered smoking cessation resources. The BMC Lung Nodule Clinic is available for care of patients with incidental or screen-detected pulmonary nodules (generally Lung-RADS 3 and 4). The physicians also can conduct shared decision making visits for patients considering whether to undergo lung cancer screening. When making a referral, please provide patient's phone number (best contact number), address, primary care provider contact information, as well as a CD copy and accompanying report of any CTs of CXRs performed at another hospital. BMC Physicians: Enter a patient referral in EPIC by typing "Lung nodule" in the Meds and Orders dialogue box. Non-BMC Physicians: Please call 617-638-7480. The Lung Nodule Clinic requires reports and scans of any previous chest imaging performed outside of BMC. BMC Physicians: Physicians can directly enter a patient referral in EPIC to the Tobacco Treatment Center by typing "Pulmonary smoking" in the Meds and Orders dialogue box; this will take you directly to the correct referral (please note the specific instructions that apply to Medicare vs. non-Medicare patients). Non-BMC Physicians: Please call 617.638.7480.